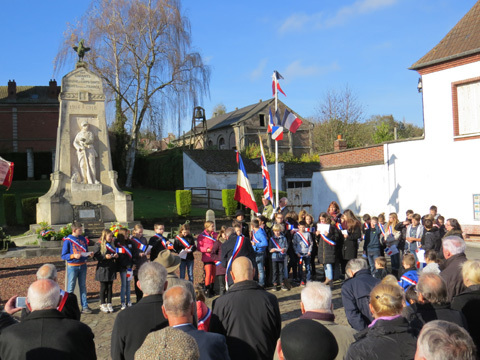 The day was sunny and dry, we welcomed 9 members from the Longpré jumelage to Eastry for the Remembrance Sunday service at St Mary's Church. 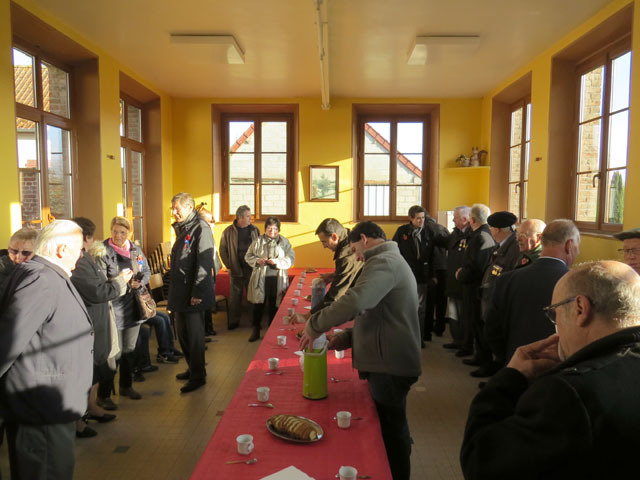 We (Nick and Lesley) provided them with some bacon and traditional sausages for a late breakfast before making our way to the church for the parade and service. 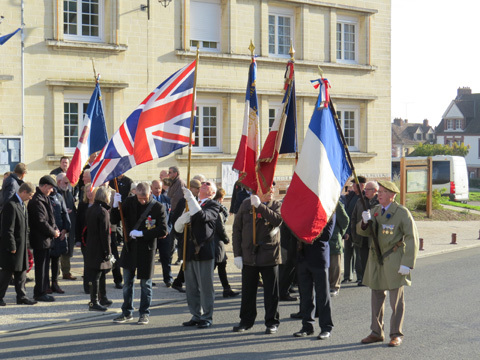 The various organisations were well represented at the commemoration which always impresses our friends from Longpré, I won't list them all for fear of forgetting and upsetting anyone but it is quite a spectacle to see all the uniformed groups and sections marching in and gathering around the cenotaph in the churchyard. 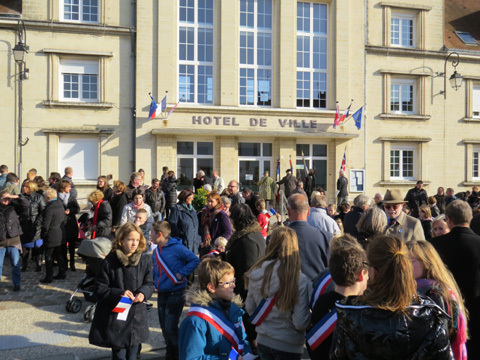 Guests from Longpré gather before the parade. 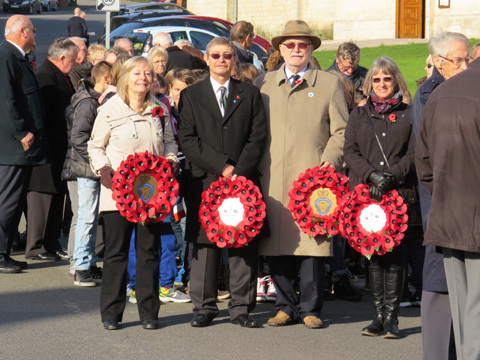 Representatives from the various organisations join the parade. 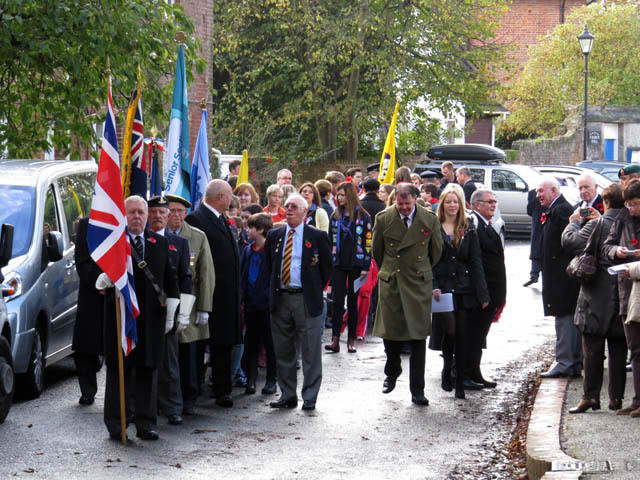 The standard bearers lead the people into church. 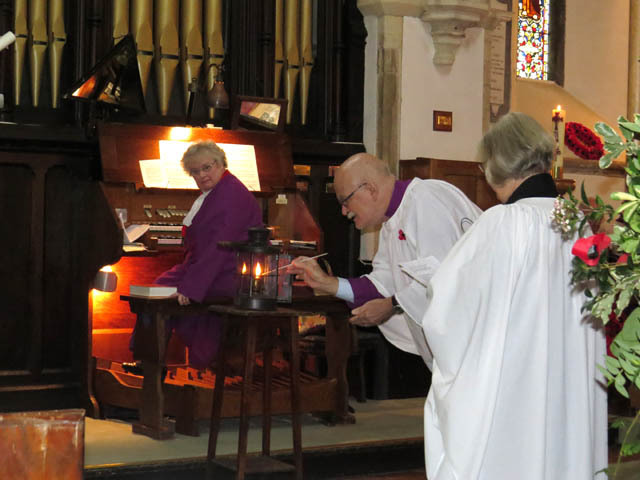 The ceremony follows a well practised routine, the Revd. 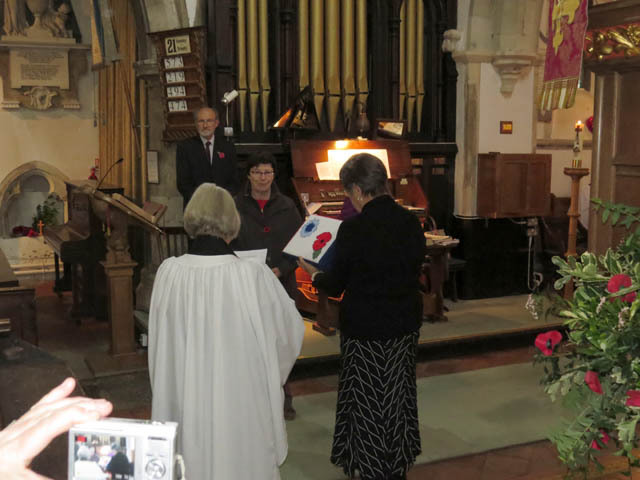 Jennifer Pilcher took the service, with laying of wreaths, reading aloud the names on the cenotaph and the 2 minute silence before filing into church for the service. There was a presentation of a hassock (kneeler) to Longpré and Bill Clague lit the WW1 lamp donated to us by René Bilhaut in 2012. 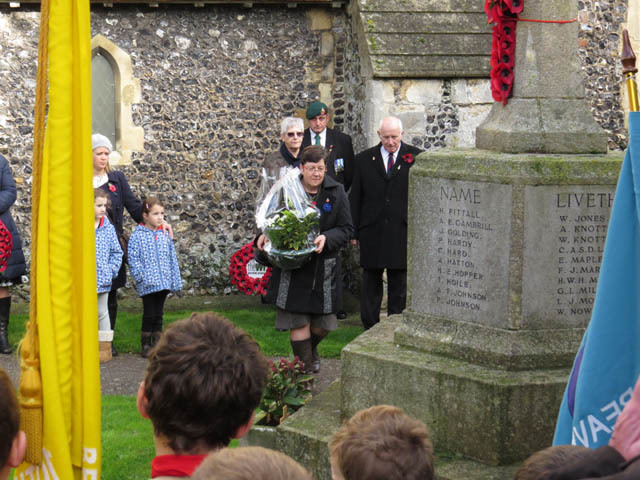 Patricia lays flowers at the cenotaph. Presentation of the embroidered hassock. Bill lights the WW1 trench lantern. 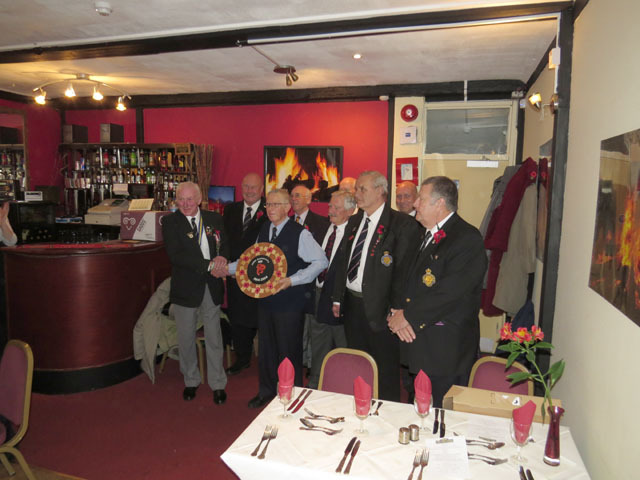 After the ceremony at the church we retired to the 5 Bells for a traditional Sunday roast, where the Royal British Legion representatives gave Michel from Longpré a commemorative plaque to mark the 100th anniversary of the start of the war. One for the album, in front of the cenotaph. 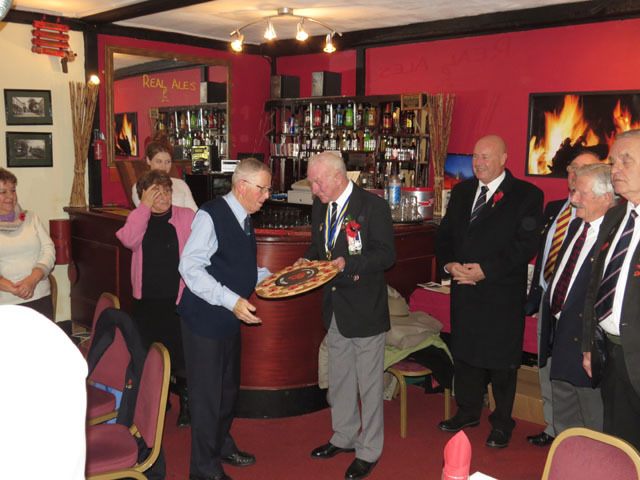 Michel Bonneval from Longpré receives a gift from the RBL. 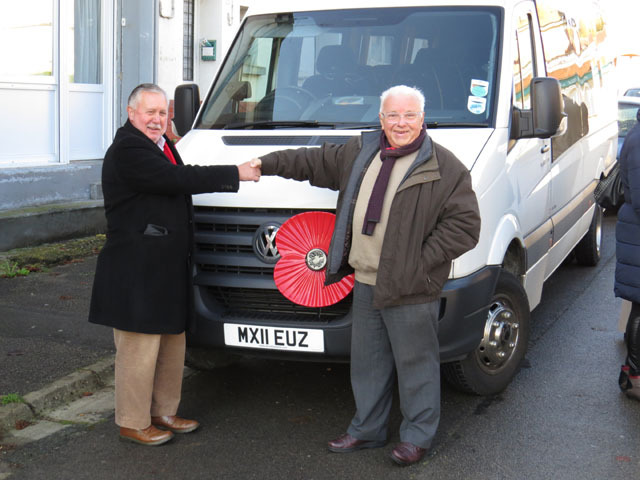 Members of the Eastry branch, Royal British Legion with Michel. 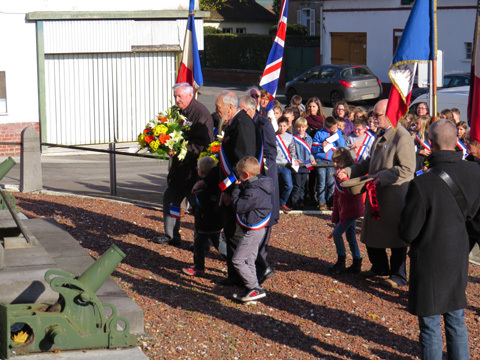 In a change from the usual very early start, we were invited to go to Longpré the day before Armistice day. With November 11th being a Tuesday, and also a public holiday, lots of our friends in Longpré were taking the Monday off as well, and had arranged a day out for us all. 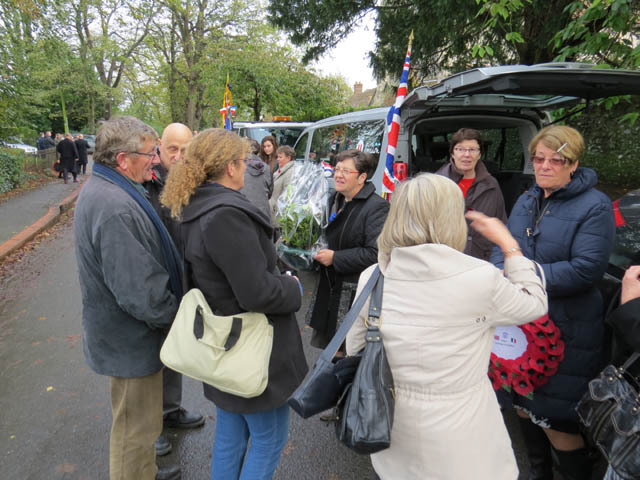 There were 10 plus of us plus the driver travelling from Eastry in a hired mini bus and arrangements had been made for us all to stay with host families. We met up with a fleet of cars travelling from Longpré-les-Corps-Saints and made our way to the town of Péronne, ~midway between Amien and Saint-Quentin approximately 100 km from Longpré. Lunch had been arranged for us in an eatery attached to a hypermarket a little way short of our destination, and very enjoyable it was, hearty portions of boeuf bourguignon and French fries was one option (which I chose) and I don't remember the other but everyone seemed happy with their choices. 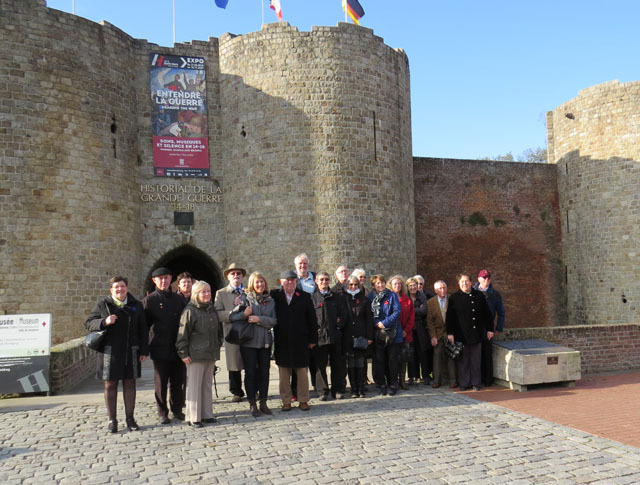 The venue for our trip to Peronne was a very interesting museum of the history of the Great War, in the Château de Péronne. We had a few hours to explore the large array of artefacts in the museum before heading back to Longpre via the memorial at Thiepval. 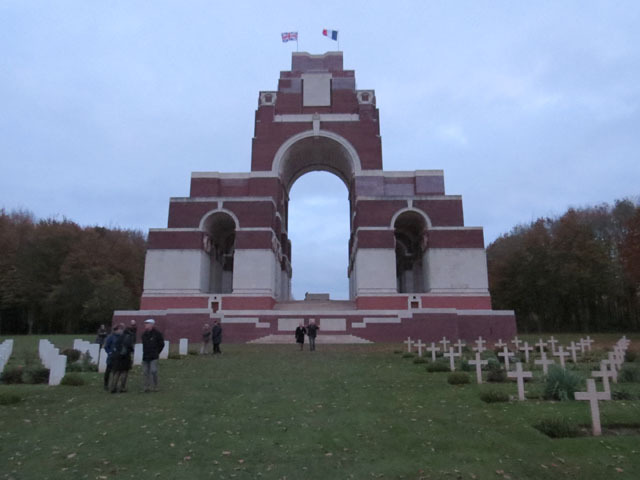 The Thiepval Memorial to the Missing of the Somme is a war memorial to 72,195 missing British and South African men, who died in the Battles of the Somme of the First World War between 1915 and 1918, with no known grave. We arrived just before sundown and it was very moving to see all the thousands of names, arranged alphabetically in regiments, engraved on the many faces of the monument as the sun set over the site. Terry greets Louis Jacques on our arrival in Longpré. Outside the museum in Peronne The monument at Thiepval, designed by‎ ‎Sir Edwin Lutyens. 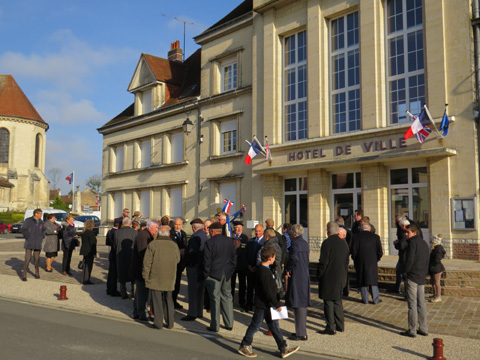 With another change to the traditional routine we gathered early to join the neighbouring village of Bettencourt -Riviére for their Armistice parade, it is a small community barely a couple of kilometres away from Longpré. This routine may normally take place but as we usually have to leave the UK at 05:00 in order to get to Longpré by ~10:00 we have never arrived early enough to participate. 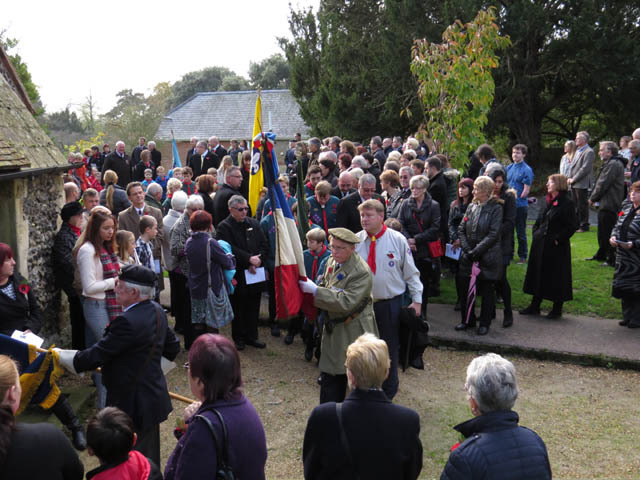 We gathered in the small car park there and then processed the short distance to the memorial. 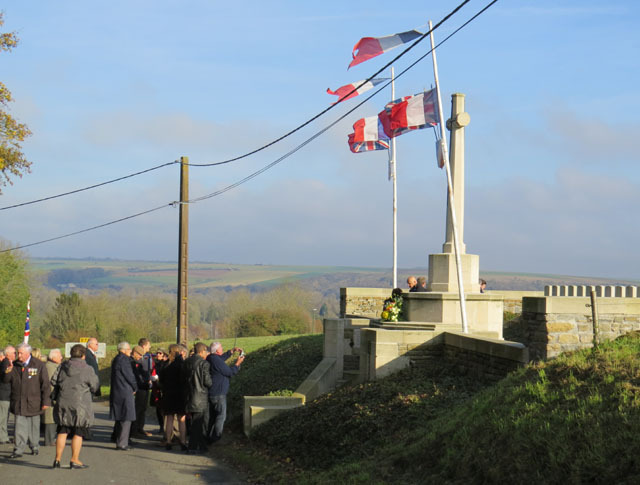 Speeches were made, wreathes laid and flags lowered before heading off to the small function room for coffee and cake - or more accurately gateau battu, a speciality of the Somme department. 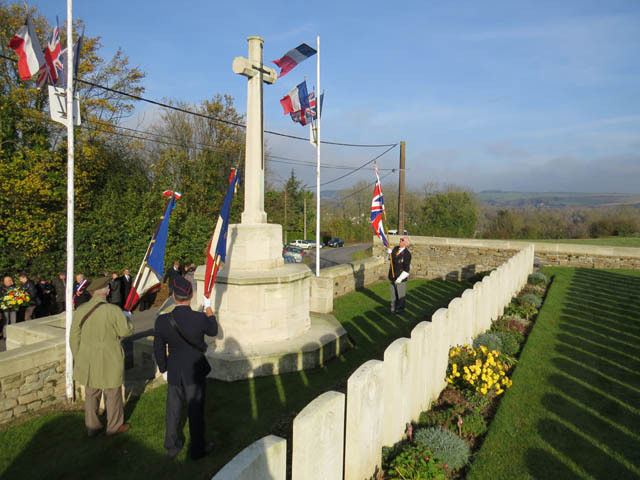 We then had to hurry back to visit the British cemetery before the church service began at 11:00. 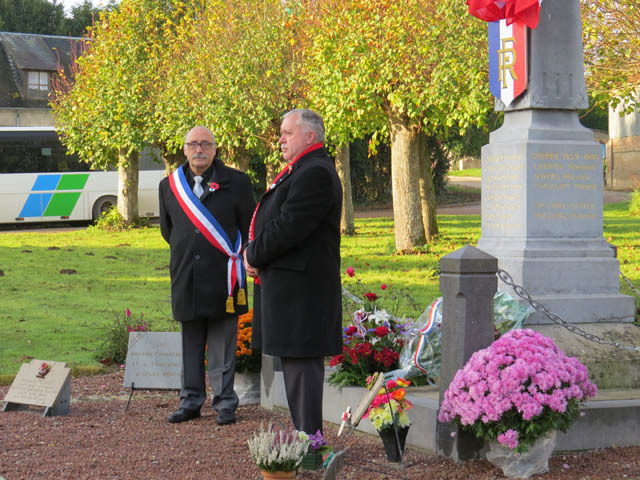 At the memorial in Bettencourt-Riviére Flags are lowered at the war memorial. Coffee and gateau battu. And then on to the British & Commonwealth WW1 cemetery in Longpré. 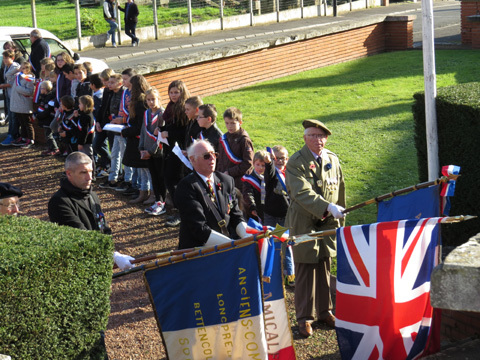 Making our way to the British & Commonwealth cemetery. 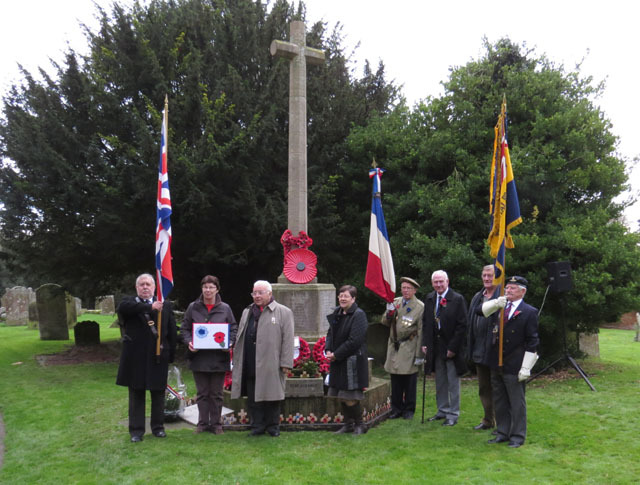 Standard bearers at the cemetery. 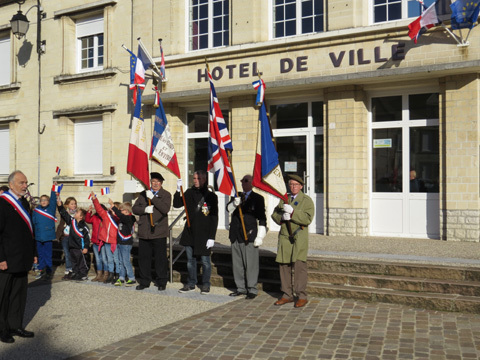 A few photos before heading back to the Mairie and then church. 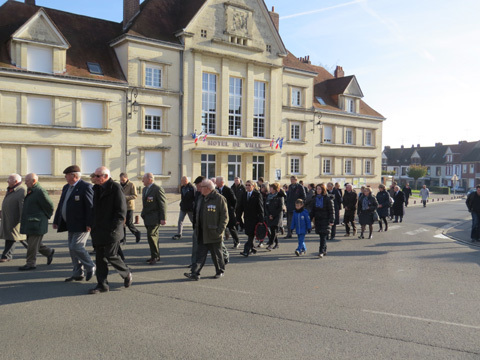 We made our way back to the Hotel de Ville to join everyone else for the service in the church. 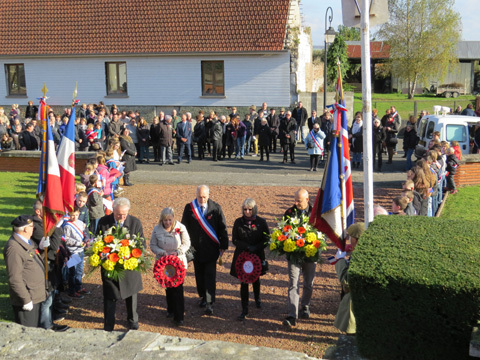 After the church even more people joined in for the procession around the village, stopping first at the 'Monument to the dead 1914 -1918' where representatives of the community read speeches to honour the fallen, flowers and wreaths were laid and several Longpré children read out messages. 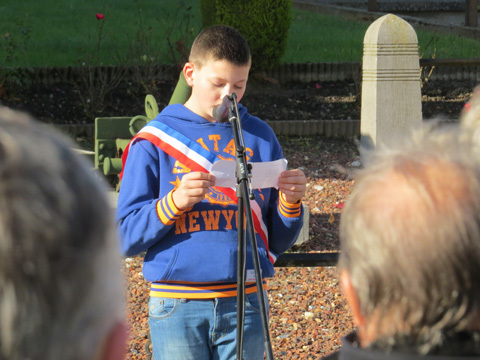 The second stop is at the 'Monument to the 5th and 6th of June' (see http://www.eastrytwinning.co.uk/memorials.htm ) where the procedures were repeated, and finally returning to the Hotel de Ville and Mairie for a vin d'honneur. Above - Gathering at the Hotel de Ville. 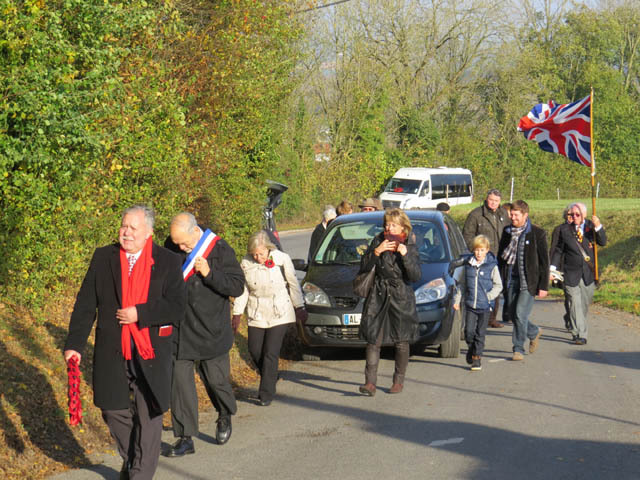 Below - The procession around the village from church. 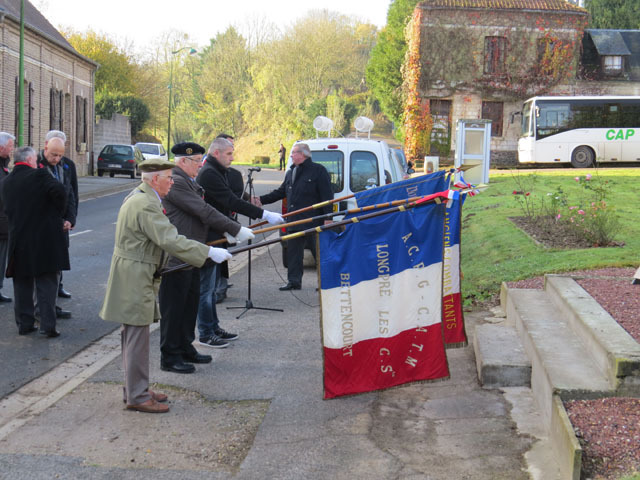 Standard bearers unfurl their flags. Everyone waiting to join the procession. 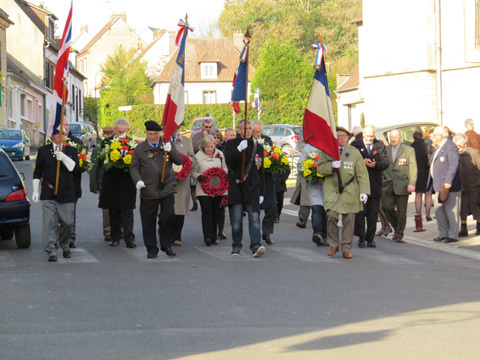 Heading to the church for the Armistice service. 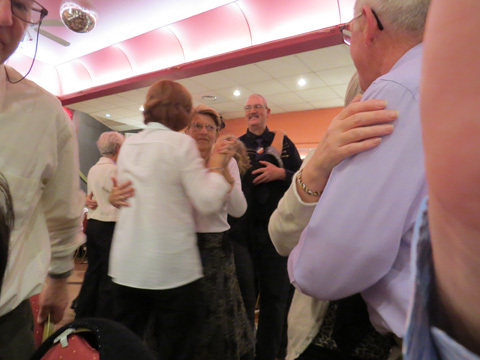 With the formal part of the ceremony over and drinks and 'nibbles' provided at the Mairie, we were then taken to the neighbouring village of Hangest-sur-Somme and the 'Restuarant du Canard' for a very enjoyable meal - of several courses, and with dancing to accordion music. This has been a traditional venue for a few years now and at least 3 other communities come together to share the restaurant for this event. It was all too soon that we had to say our farewells and head off for the Shuttle home, it had been a very interesting and, despite the solemnity of the occasion, enjoyable couple of days. We thank the people of Longpré and especially the members of the jumelage for their warm welcome and generous hospitality.